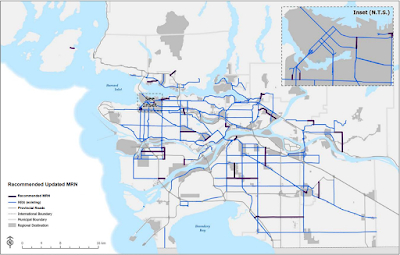 One of the unique attributes of TransLink among transportation agencies in North America is that it is responsible for both providing transit services and maintaining a portion of our regional road network. I posted about the funding that municipalities in the South of Fraser received in 2017 to maintain the Major Road Network (MRN), and to expand walking and cycling infrastructure, last month. This subsidy worked out to $20,205 per lane kilometre in 2017. 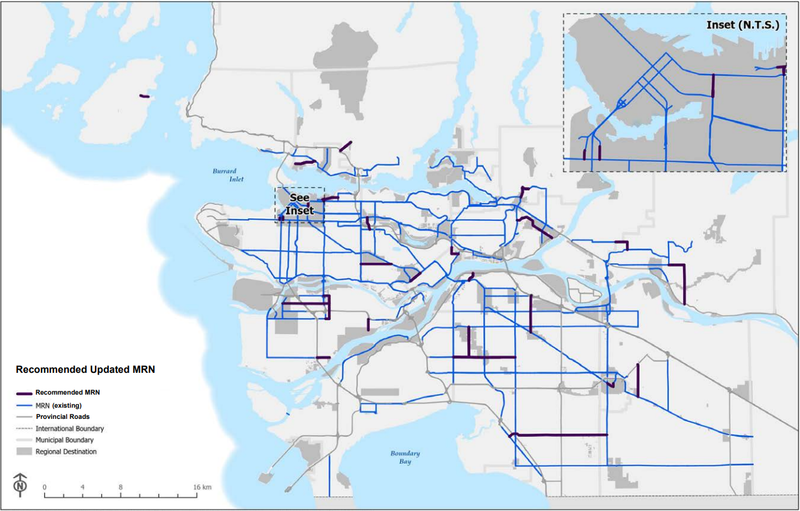 When a road is part of the MRN, it also becomes eligible for 50/50 cost-sharing between TransLink and the local municipality for projects that increase the flow of people or goods. This could include enhancing sidewalks, bike lanes, bus lanes, and even general travel lanes. Facilitates intra‐regional travel of people and transportation of goods. Forms an interconnected and complete network. Moves high volumes of general purpose vehicles, transit passengers and/or trucks. Maintains road and bridge structure conditions in a state of good repair to support all modes. Minimizes adverse impacts to adjacent neighbourhoods. As part of new funding that was unlocked by the Mayors’ Council 10-Year Vision, the Major Road Network will be growing by 10%. The following map shows the current MRN with the proposed additions to the network. Current MRN in blue. Proposed additions to MRN in purple. Select map to enlarge. 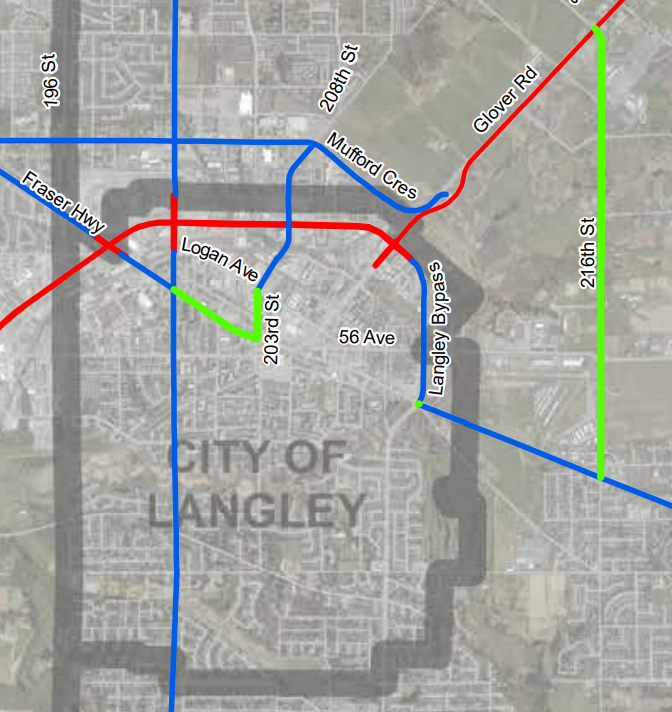 In Langley City, additional sections of Fraser Highway and 203rd Street are being proposed to be included in the MRN. Road network in Langley City. Provincial highways in red. Currently MRN in blue. Proposed additions to MRN in green. Select map to enlarge. If these additional sections of road are included in the MRN, the current local funding that is being used to maintain these sections of road can be reinvested to better maintain other parts of our road network in Langley City. 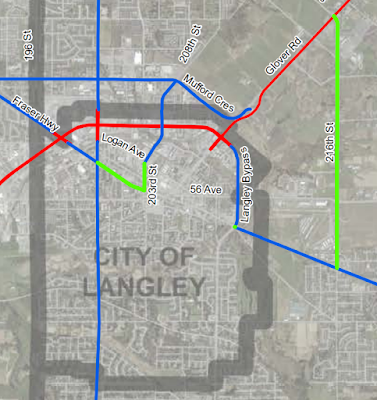 With the new Fraser Highway B-Line in the works, it should make it easier for Langley City to cost-share implementing transit priority measures, and enhance cycling and walking infrastructure along Fraser Highway and 203rd Street.